Last week, the entire cryptocurrency market saw a massive bloodbath with all major cryptocurrencies such as Bitcoin [BTC], Ethereum [ETH] and Litecoin [LTC] plunging by more than 10% within a few hours. Nonetheless, the bear continues to show no mercy on the market as it faces yet another bloodbath. Monero [XMR], the tenth-biggest cryptocurrency in the market, is one among the cryptocurrencies that were crushed by the bear. The most popular privacy coin has plummeted by 23.97% in the past seven days. According to CoinMarketCap, at press time, the coin was trading at $79.93, with a market cap of $1.32 billion. It has a trading volume of more than $21 million and has fallen by 10.16%. Most of the trade volume for the cryptocurrencies was recorded on Bithumb, one of the leading cryptocurrency exchange in Korea, with XMR/ KRW trading pairs. It is followed by Binance, the biggest cryptocurrency exchange in terms of trade volume, with XMR/ BTC trading pairs. The other exchanges included Bitfinex, IDCM, and Poloniex. Additionally, the coin is currently trading at its lowest point in the entire year. The previous low recorded was at $81.27, which was set in the month of August 2018. The cryptocurrency’s highest trading point is set at $480.94, which was in the month of January 2018. 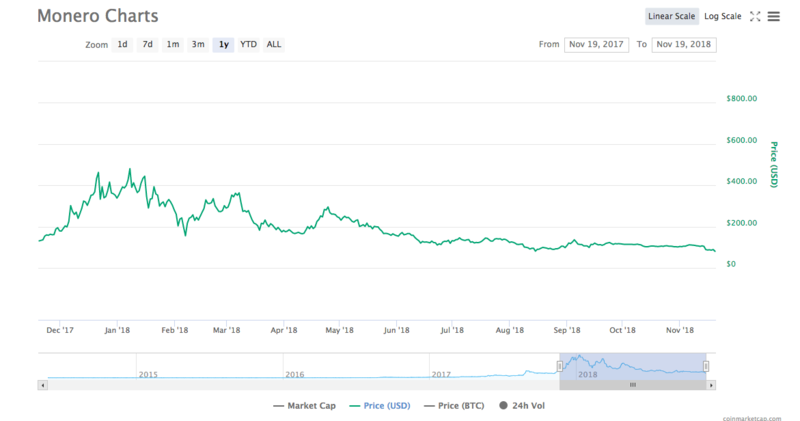 Since then, the privacy coin has lost almost $400 of its value in the past eleven months. Recently, Monero [XMR] was listed with a new pair on Poloniex, one of the leading cryptocurrency exchange platform around the world. The token was paired with USDC coin, a stable coin by Circle. Moreover, the privacy coin gained the attention of Nouriel Roubini, the analyst who predicted the 2008 economic crisis. The economist stated that the Federal Bureau of Investigation will soon crack down the tenth biggest cryptocurrency. The post Monero [XMR] price crashes by over 10%; reaches its all-time low for the year appeared first on AMBCrypto.